They did not do show any interest in breeding in 1999 from our observations and they were also still young. They were under two years of age and this year they would be approximately two and a half. 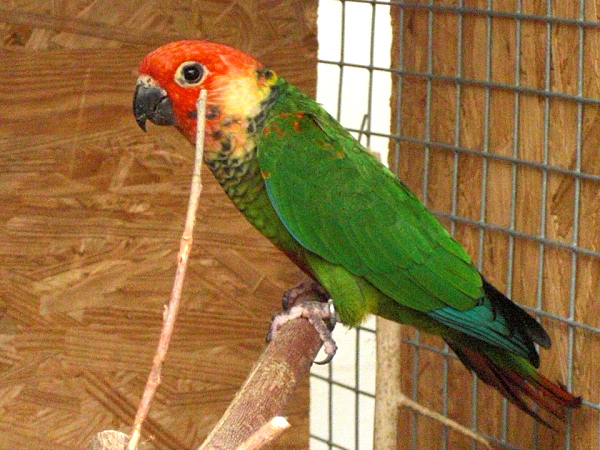 In October of 1999 I moved three quarters of the birds from the basement to the garage but kept the roseifrons in the basement along with two other pairs of mini-macaws. The following season, there was virtually no noise and no visual contact with any other birds or humans. Ironically, I kept this pair on top of one of the snake tanks where I had some Burmese Pythons. The roseifrons did not see the snakes below them therefore did not sense their presence. The snakes on the other hand were able to smell food in the air at all times. As weeks went on, I noticed the female was being over preened on her head by the growing bald area. I also observed they were spending the same amount of time in the nest but heard more squabbling taking place around May. At this time I was feeding a very well varied seed diet consisting of 5 types of millets, hemp, oats, groats, milo, niger, buckwheat, canary seed and 1 or 2 others that I may have not addressed here. These seeds were also served sprouted that I served to them 1-2 times per week. Sprouted beans consisted of moong, black, navy, fava, red kidneys, adzuki, chick peas and again a few others that I may have not addressed here. These servings almost always resulted in empty bowls as they relished them. Fruit servings consisted of diced apples, pears, bananas, papaya, mango, strawberries, cherries, raspberries, blueberries, honeydew, canteloupe, leechi nuts. Vegetables also varied in consistency with red, yellow and green peppers, cucumbers, tomatoes, broccoli, cauliflower, greens, beets, yams and more others that were usually found in the refrigerator. There was no set pattern for all of these foods and varied the combination of these ingredients as much as possible so they always looked forward to something different in their daily offerings. Approximately one month later I saw her vent area was looking very plump. She laid her first egg a couple of days later on May 31st and then three more consecutively in one week to the 6th of April. The third egg had a chip in it and this retarded the development of the egg due to dehydration. It dried out and died within 5 days of being laid. The first, second and fourth were all fertilized and the embryo was visible at about 3-4 days. The first egg began hatching on June 24th and the baby weighed an accurate 4.1 grams, the other two continued hatching up to the 28 of June. The other two were also at 4 grams. At 15 days, they were banded with seamless aluminum rings. They were kept in the nest to be reared by the parents to full term or ‘to the perch’. All the offspring were fully weaned by the first week of September and had immature colouration. This consisted of dark grey to black and no pink colouring on the head and the scalloping on the breast was not as prominent as the parents but the rest pretty much resembled them. Colouring does not really begin to appear until the second year. The babies pink spectrum on the head bloom in more sporadic areas than the parents as the parents still had yet to completely mature in colour. One interesting anecdote is this species is like almost no other in the bird kingdom where the roles reverse with extraordinary colour presentation just as the Eclectus parrots, the females are strikingly more appealing to the human eye than the males when in full maturity. I have come to realize after keeping these birds for more than 17 years, I now have pairs that take almost 5 years to fully colour and find they generally reproduce after 3 years of age. 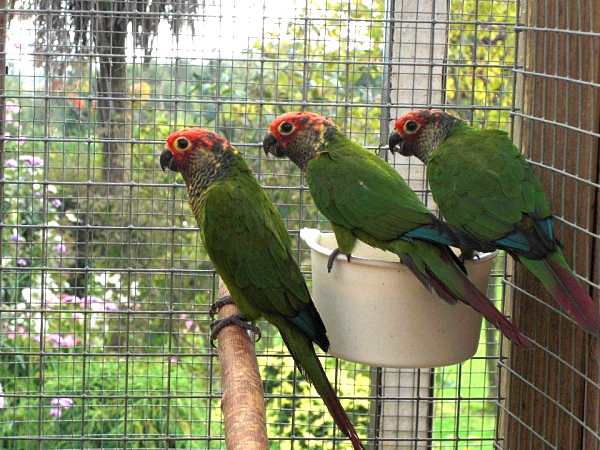 I have also found that aviculturists tend to give up quite easily on these charming birds because they presume these birds should produce in the first or second year like most other pyrrhuras and move them from their collection due to non-productivity. This is one species I have found where patience truly is rewarded. I have bred them to the 2nd filial generation thus far and hope to continue to keep the offspring to circulate with more unrelated bloodlines that are being more readily available in Canada to ensure stable populations remain in the future. Hi David, it was motivating to read your experience on the roseifrons. I have noticed some similar signs of breeding regarding the female’s feathers being worn. Mine is not bald, but I’ve noticed worn feathers on her head. 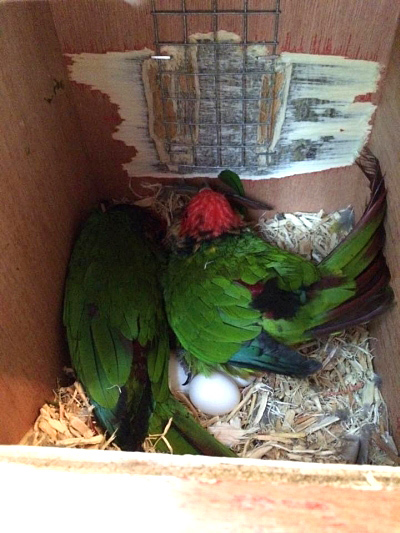 More disappearing acts into the nest box are common now with the female spending the most time in the nest box. I bought the pair from a nice bird breeder that may have experienced what you mentioned about giving up on them. 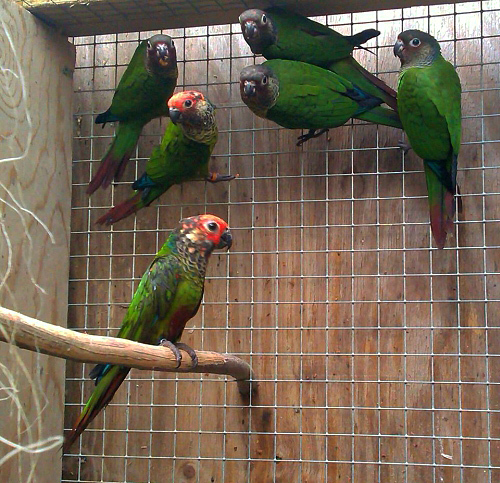 They are close to three years old with the female showing more red on her head. Is it typical or is it the norm that females will show the most pink/red on their head (after 4-5 yrs. )?